Her face is beet red, and her tiny body is wracked with sobs. My daughter flings herself to the ground of the department store changing room in an angry protest. Her grandmother is about to buy her a special dress, but my child is filled with rage because she wanted three dresses. Yes, even the one she claimed didn't "spin right," and the one she refused to even try on. Inferior as they may have been, she wanted to bring home allthedresses. So instead of saying "thank you!" to Grammy, she bawls and rages on the filthy dressing room floor. She's not an a**hole; she's just a 3-year-old. Her sweet little friend implores her to join her in a game of "walk the stick." (WTF? Whatever.) My daughter politely refuses. Her angelic-looking friend's little face crumples with disappointment. "Sophie?" I remind her pleasantly. 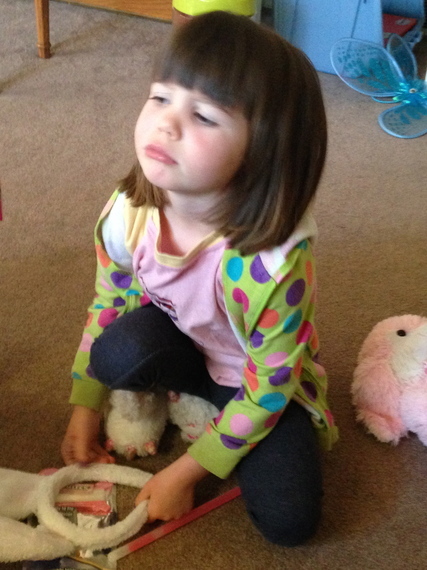 "Remember how sad you were last week when you wanted your friends to play Rescue Bots and they said no? This is how Emma feels right now. Why don't you play 'walk the stick' for a few minutes?" She stares at me impassively. "No, thank you!" she chirps, turning on her heel to walk away. She's not a sociopath; she's just a 3-year-old. It's time to use the bathroom before we leave the house. My daughter refuses to go. "Oh, good, because Mommy has to go really badly," I lie, scrambling for the bathroom. "Do you need to go really bad?" my preschooler asks with interest. "Are you going to pee your pants?" I nod somberly and watch her race me to the toilet. She's not a sadist; she's just a 3-year-old. "May I watch 'Rescue Bots' when we get home?" my daughter inquires. "Yes, you may!" I respond cordially. "Your sister has piano lessons and you may watch an episode before we go grocery shopping." My happy child suddenly throws her bowl of Pirate's Booty to the floor of the minivan and arches her back with indignation. "But I want to watch A LOT OF SHOWS!!!" she explodes, eyes bugging. She's not an ingrate; she's just a 3-year-old. "It's time to take a bath!" I announce, filling the tub with water. "But I caaaan't!" my daughter wails. "My knee hurts!" "Would you like a Band-Aid?" I offer helpfully. "NO! THAT WILL MAKE IT WORSE!" she retorts, outraged at my incompetence. "Should we put some cream on it?" I suggest. Had she the dexterity, she would have flipped me the bird. Instead, she sighs with exasperation and covers her face with her hands. She is clearly dealing with total idiots here. She's not a drama queen; she's just a 3-year-old. When in my threenager's company, I rarely go more than several minutes without encountering her dark side. She is constantly sobbing over some injustice, be it my refusal to allow her to ingest the entire Costco box of Annie's Organic Fruit Snacks or the fact that her Dora night-light isn't properly aligned with her bed railing. It's as though she lives in a constant state of PMS and has just found out that chocolate is now illegal and her favorite soap opera has been canceled. I contemplate crushing up some mood stabilizer and sneaking it into her yogurt tube. But then I remember: she's not chemically unbalanced. She's just a 3-year-old.